This is tangy and crunchy South Indian rice dish.The beauty of the dish comes from the simplicity of spices used in it.I personally never eat this with any curry as it takes away from the dish so Curd and Papad are the best accompaniments with it. Make this as a Sunday meal and I am sure your family will relish it!! After soaking rice for 20 minutes boil water in a pan.Add haldi and salt to boiling water and cook the soaked rice till 90% done. This is done to avoid overcooking the rice and making it too soft. Please note that we should avoid using a basmati rice for this. 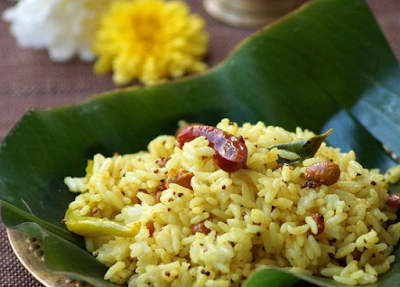 A regular Kolam works best for this dish as it holds the flavour of dish better than basmati.